The Brewer Company was awarded the Health Industry Distributors Association (HIDA) Product of the Year for 2006 for the Brewer Access High-Low Exam table!! Brewer has done it again. Introducing the Brewer Access High-Low Exam Table; premiering the industry’s first true chair to table design that easily take patients from consultation to examination. 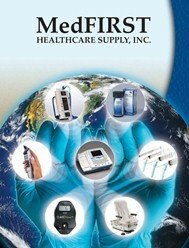 most convenient for patient consultations and examinations. safest for patient and wheelchair transfers. 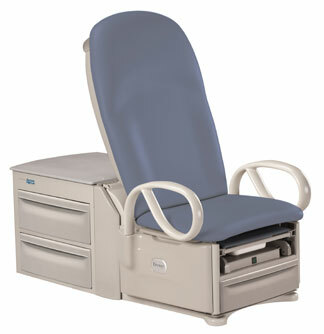 most technologically advanced high-low exam table on the market. - Chair-to-table design effortlessly takes patient from consultation to examination. Return to chair feature easily takes table back to chair position in one, simple step (on power back model only). 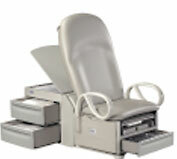 - 18" low height for easy and safe patient transfers. - Standard grab bars provide patient added safety and comfort. - Provides patients a stable and secure grab point to use when getting on and off table. - Conveniently swings out for lateral wheelchair transfers. - Easily removable and standard on all models. - Patented pass-through side drawers allow left or right access. Eliminates right or left hand setup problems. - Additional spacious front drawer. - Convenient covered paper roll storage holds up to six rolls. Cover keeps paper rolls clean. - Pass-through work surface pulls out on right or left side. Saves space by eliminating the need for additional stands or trays. Perfect for charts, instrucments, procedure preparation, or portable computer. - Comfortable, ergonomic upholstery. Easy to clean surface; seamless design. - Intuitive foot control. On / Off switch (located on the back of table) allows table's foot control to be disabled and prevents patients and / or children from moving table. - Extendable, adjustable ergonomic stirrups. Easy on / off for patients. Standard on / off switch. Pass-through work surface on side of table. Backrest adjusts for easy patient positioning. Easy to clean, seamless upholstery. Toe board / leg extension / plastic debris tray. 18 standard upholstery color options. 6 premium, plush upholstery color options. Length: 57" extends to 72"
Storage capacity: 23" x 23" x 3.25"
Front drawer: 19.7" x 19.2" x 4"
Side drawers: 22.7" x 20.2" x 7"
Pass-through side drawers accessible from right or left side of table.